The first NAWSARH helicopter performed its maiden flight in March 2016. Image courtesy of Leonardo – Finmeccanica. The NAWSARH helicopters are equipped with Osprey E-Scan AESA radars. Image courtesy of Leonardo – Finmeccanica. Norway signed a contract for 16 new AW101 search and rescue helicopters in December 2013. Image courtesy of regjeringen.no. The NAWSARH helicopter deliveries will begin in 2017. Image courtesy of regjeringen.no. The new NAWSARH helicopters are based on the AW101 medium-lift search and rescue helicopter manufactured by AgustaWestland, a division of Leonardo-Finmeccanica. Maiden flight of the first NAWSARH was performed in March 2016 and the aircraft was officially unveiled in May 2016. The helicopter deliveries will commence in 2017 and are expected to conclude by 2020. The NAWSARH programme was undertaken in October 2011 with an aim to replace the ageing Sea King SAR helicopter fleet of the Royal Norwegian Air Force by 2020. 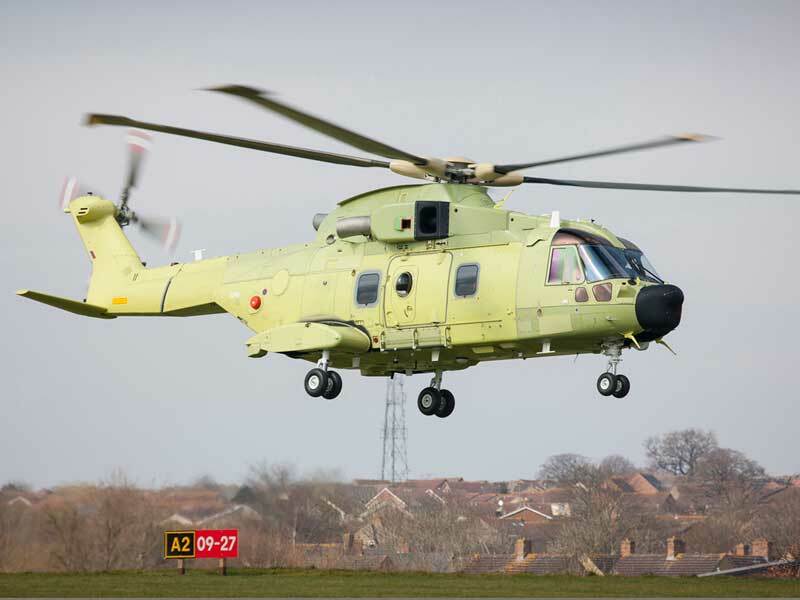 The Norwegian Government signed a €1.15bn ($1.57bn) contract with AgustaWestland in December 2013, for the supply of 16 new AW101-612 model SAR helicopters along with technical support, pilot training and spares for the NAWSARH programme. The contract also includes an option for six aircraft. A full flight simulator is being built by AgustaWestland in Norway to provide support and pilot training services. In addition, the company will also provide performance-based logistics support for up to 90,000 hours of flight time over 15 years. The NAWSARH project is being managed by the Ministry of Justice and also includes modernisation of six rescue helicopter bases in Norway. The Norwegian search and rescue helicopter features crashworthy airframe fitted with composite, five-blade main rotor and four-blade articulated tail rotor. Its retractable, tri-cycle landing gear, comprising twin-wheel main and nose gear units with high flotation tyres, ensures safe landing during challenging rescue missions. The NAWSARH can be fitted with two to six crew seats. It boasts 6.5m-long and 2.5m-wide cabin with a volume of 27m³, providing enough room for accommodating up to 30 passengers or 12 medical stretchers, based on the mission requirements. The large cabin windows offer a greater view, while the large sliding doors and hydraulically-actuated rear ramp facilitate easy loading / unloading of equipment and survivors. Other features of the NAWSARH helicopter are crashworthy self-sealing fuel tanks, in flight re-fuelling capability, and ice and snow protection system. NAWSARH features night vision goggle-compatible glass cockpit with integrated flight management system (FMS), four-axis digital automatic flight control system (AFCS) and integrated avionics suite. The rotary-wing helicopter is also fitted with synthetic vision system and high-definition electro-optic / infrared sensors, providing crew with day and night situational awareness in all weather conditions. The on-board laser obstacle avoidance system (LOAM) and obstacle proximity light detection and ranging (LIDAR) system (OPLS) help improve flight safety. Equipped with a range of SAR mission systems, the new NAWSARH helicopters have the ability to rescue more people in distress. "Equipped with a range of SAR mission systems, the new NAWSARH helicopters have the ability to rescue more people in distress." The equipment includes single or dual rescue hoist, a searchlight, fast rope and rappelling system, loud speakers, medical equipment, and patient treatment area. The onboard advanced navigation systems and cockpit and cabin communications help provide greater mission flexibility. Additionally, NAWSARH is equipped with a lightweight, flat-panel Osprey E-Scan AESA (active electronically-scanned array) surveillance radar system with no moving parts, developed by Finmeccanica airborne and space systems division. The Osprey AESA consists of three flat panels, one at the nose section and two towards the rear, providing a 360° field of view. Powered by three GE CT7-8E turboshaft engines, the NAWSARH can fly at a maximum cruise speed of 277kmph and can operate up to a range of 1,363km. It has a service ceiling of 4,570m and a hovering IGE of 3,307m. The engines, controlled by full authority digital engine control (FADEC) system, offer superior hot and high performance. Each engine delivers a take-off power of 1,884kW and a maximum continuous power of 1,522kW. With a maximum gross weight of 15,600kg, the helicopter can carry loads weighing 4,536kg, externally. NAWSARH has a 30-minute run dry gearbox capability and can operate in one engine inoperative (OEI) condition.